Yes, you can make lighter, healthier fried chicken and keep the flavor! 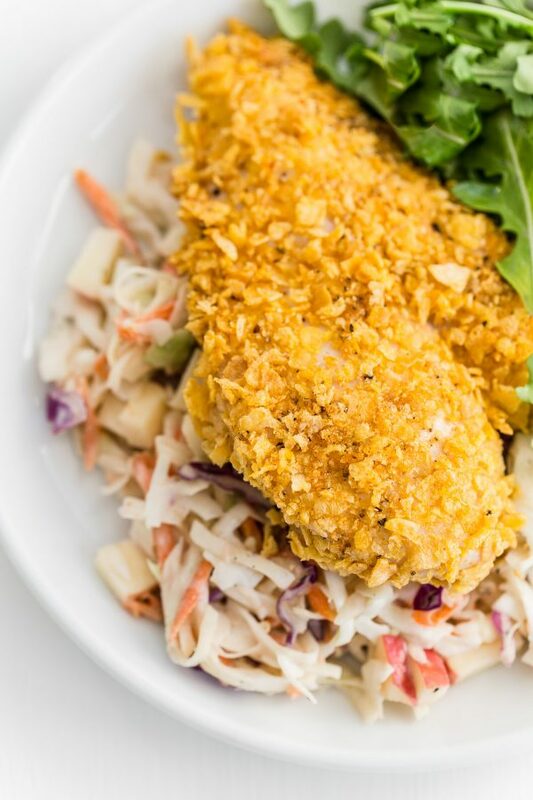 Make this oven fried chicken recipe with crispy seasoned cornflake coating and honey mustard apple slaw! I’m pretty certain this isn’t the association I’m supposed to have with fried chicken, but whenever I even consider it, I can’t help but think of my friend Gina. The woman is just in love with fried chicken, and I’m right there with her. Just last week, we were out to lunch with friends at one of my favorite restaurants in Manhattan, Momofuku Ma Peche – a stand-out Asian spot known for its pork buns and rice cakes (among a dozen other things) – and there on the menu, within seconds of browsing, she found her favorite, “Habanero fried chicken with lime?” Done. Today, I’m revisiting fried chicken with a recipe that packs in a whole lot of flavor, thanks in part to Old Bay! – and creates a perfectly crispy-crunchy coating. My oven fried chicken uses both breasts and thighs. I prefer the thighs because they have more flavor and are generally more tender, but dark meat isn’t everyone’s favorite, so making both is a good compromise. Marinating the chicken beforehand in buttermilk is helpful in tenderizing and boosting juiciness. As for coating the chicken, I chose cereal! 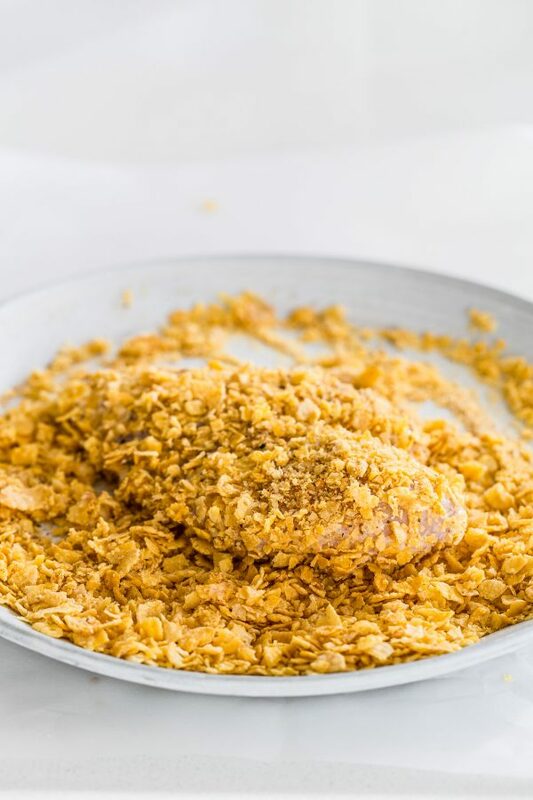 Crushed cornflakes give the chicken such a perfectly crispy-crunchy coating, and a little Old Bay thrown into the mix adds flavor in spades. I’m pairing the chicken with a Honey Mustard Apple Slaw for a cool, refreshing side. It’s sweet, creamy, and creamy, made with a little bit of buttermilk and nonfat Greek yogurt to keep it light. *Update: A comment below got me thinking, this slaw could easily be made without dairy! Just replace the slaw’s buttermilk and greek yogurt with 1/4 cup extra-virgin olive oil (total), add 2 tablespoons apple cider vinegar, and keep the remaining slaw ingredients as is (honey, mustard, etc.)! Altogether, this is comfort, my friends. 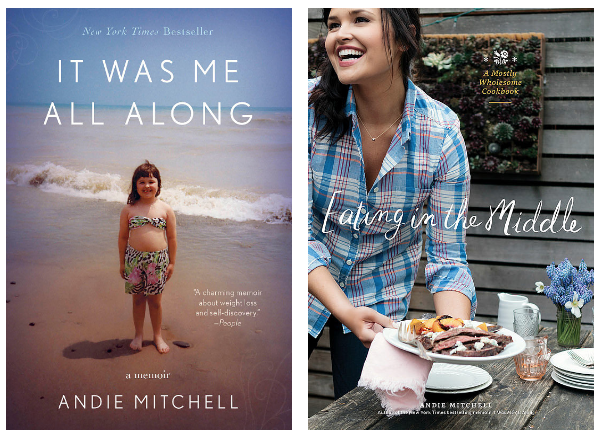 Lightened-up comfort, but still comfort, so enjoy! For the honey mustard apple slaw, in a medium bowl, whisk together the buttermilk, yogurt, honey, mustard, salt, and pepper. Stir in the coleslaw mix and apple. Cover and refrigerate until ready to serve. The mild acidity of the yogurt and buttermilk will cause the cabbage (the coleslaw mix) to soften and wilt, therefore releasing a good amount of its moisture. Toss the slaw thoroughly before serving, and feel free to drain any thin liquid that has pooled in the bowl before serving if you make it ahead of time! In a large resealable plastic bag, combine the chicken breasts and thighs with the buttermilk, tossing to coat all of the chicken. Seal the bag and refrigerate, turning the bag once or twice if you can, for at least 1 hour and up to 24 hours. Preheat the oven to 375 degrees F. Set a wire cooling rack on top of a large rimmed baking sheet and coat it with cooking spray. In a large shallow dish, stir to combine the corn flakes, Old Bay, garlic powder, onion powder, salt, and pepper. Remove the chicken from the buttermilk, shaking off the excess. Discard the buttermilk. Dredge each piece of chicken in the cereal mixture, turning to coat both sides. Place the chicken breast on the prepared wire rack. Repeat the coating process with the remaining chicken pieces. Spray the chicken well with oil. Transfer the pan to the oven and bake until crispy, golden brown, and cooked through, 35 to 40 minutes. Transfer the chicken to a serving platter and serve 1 piece of chicken (1 breast or 1 thigh) with about ½ cup slaw. Is the NI available so I can figure out the ww points? Hi Debbie! Ah sorry! I thought I included it earlier–just added it to the recipe at the bottom. Thanks so much for letting me know! 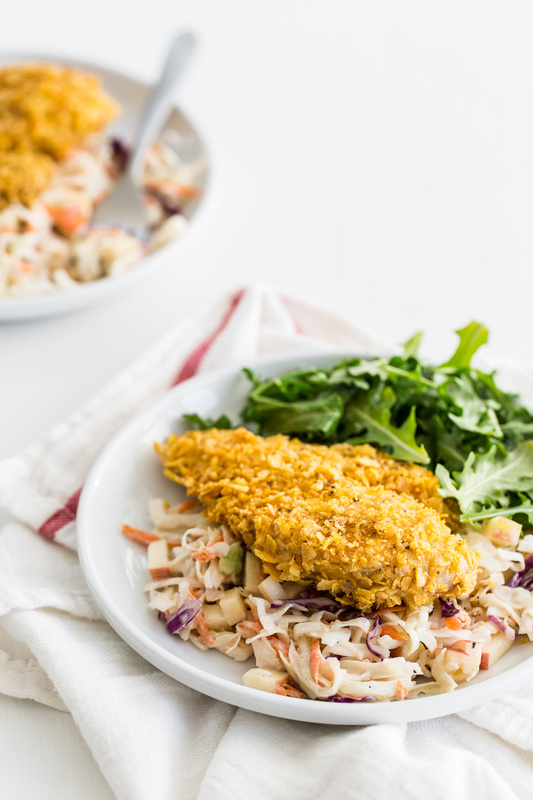 I was literally just thinking the other day how I wanted to make a “fried” chicken recipe so badly….and then you shared one, with this slaw that I now need in my life! Good question! I haven’t tried it, but I’d say: replace the buttermilk and greek yogurt with 1/4 cup extra-virgin olive oil and add 2 tablespoons apple cider vinegar. Keep the honey for a little sweetness, and of course, the dijon, salt, and pepper! Should be a good swap! Yes to all of the flavors in here, especially the Old Bay. I could sprinkle that stuff on everyyyything! Love the cornflakes and I can almost hear the crunch here in CA! I AGREE–Old Bay is something I’d love on just about anything :) Thank you, Gerry! So glad we had the chance to meet at Indulge! Only slightly of topic, but when I was in NYC in February, my boyfriend and I went to Momofuku Noodle Bar and had the brisket buns… talk about insanely delicious. I’m still dreaming of them. 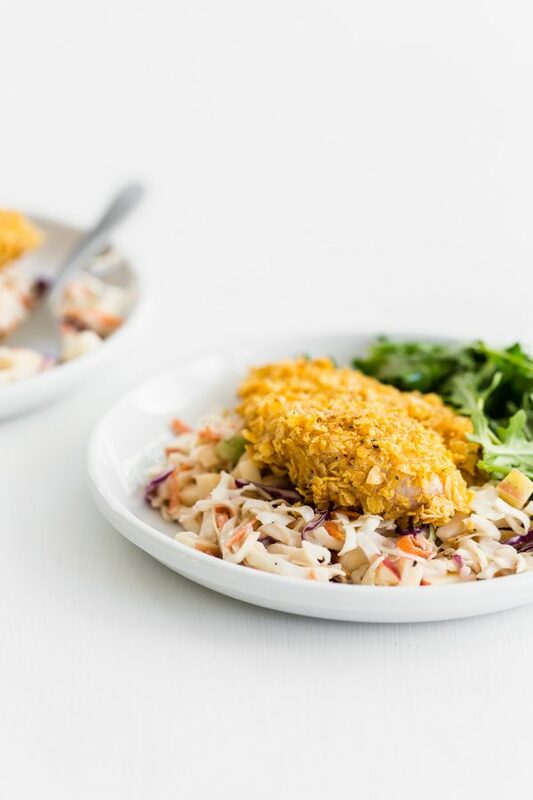 Oh my goodness … the crispiness of that chicken with the creamy, sweet apple slaw?! I can’t wait to try this out! Cornflake chicken takes me back! My grandma’s friend would always make it when we went to her house. Now I’m going to make this for my kiddos. Thanks! Made this on repeat. I made mine with chicken thighs. I used the leftovers for a great protein for lunchtime salads. And the coleslaw was terrific. Nice crunch. Yaaay! Thanks Wendy! Makes me so happy to hear that you liked the recipe!! I tried this last Saturday, and it is delish! An actual oven fried recipe that is crispy, but not greasy. I am going to try the coating on other things, such as fish, or pork. Yum. Fantastic to hear!! Thank you so much, Susan!!! Are their nondairy substitutes I could use instead of buttermilk? Would coconut milk work? The amount of onion powder is not in the ingredient, so how much should I add in? I love this recipe! 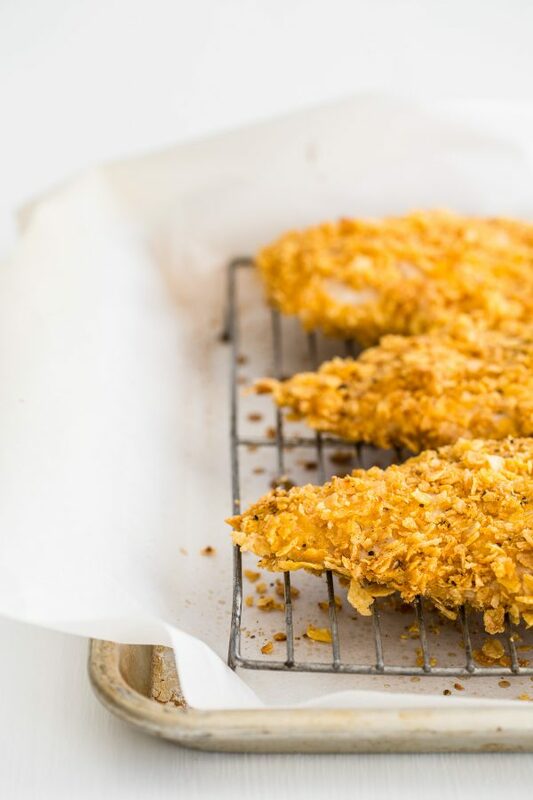 I’ve constantly been trying to find the perfect oven-fried “fried chicken” recipe, but most of them turn out soggy because they use breadcrumbs. I really like the cornflakes as an alternative and I think they’ll be even better at simulating that trademark fried chicken crunch. I’ll also be trying the dairy-free version for my lactose intolerant family members, so thank you for including that substitution! I think I would try this cut up in a soft taco or on a ciabatta bun as a sandwich instead. The pictures make this even more irresistible so I can’t wait to make this! This sounds delicious and reminds me of your recipe for Crispy Buffalo Chicken Tenders which is now one of my regulars (which I made last night!) Just wondering how much onion powder to use–I saw that listed in your recipe instructions but not in the ingredient list. Would it be the same as the amount of garlic powder? Thanks!